The blame game | Climate Etc. This is not an academic question. There are two landmark lawsuits that are gearing up, that ‘blame’ different entities. Youth filed their constitutional climate lawsuit, called Juliana v. U.S., against the U.S. government in the U.S. District Court for the District of Oregon in 2015. Other plaintiffs in the case include world-renowned climate scientist Dr. James E. Hansen, serving as guardian for future generations and his granddaughter, and Earth Guardians, as an organizational plaintiff. The fossil fuel industry initially intervened in the case as defendants, joining the U.S. government in trying to have the case dismissed. On April 8, 2016, U.S. Magistrate Judge Thomas Coffin recommended the denial of their motions to dismiss, and U.S. District Court Judge Ann Aiken upheld Judge Coffin’s recommendation, with the issuance of an historic November 10, 2016 opinion and order that denied the motions. When the defendants sought an interlocutory appeal of that order, Judge Aiken denied the Trump administration’s motions on June 8, 2017. On June 28, 2017, Judge Coffin issued an order releasing the fossil fuel industry defendants from the case, and setting a trial date for February 5, 2018 before Judge Aiken at the U.S. District Court of Oregon in Eugene. Youth plaintiffs, now age 10 to 21, and their attorneys are now preparing for trial! Two Bay Area counties sued 37 oil, gas and coal companies Monday asserting the companies knew their fossil fuel products would cause sea level rise and coastal flooding but failed to reduce their greenhouse gas pollution. The lawsuit was part of a coordinated litigation attack by Marin, San Mateo County and the city of Imperial Beach. According to an assessment of Marin’s vulnerability to sea level rise completed in June, more than 12,000 homes, businesses and institutions could be at risk from tides and surge flooding by the year 2100. A reasonably stable seashore, our nation’s Founders would agree, is an asset that should not be stolen from young people. We need to learn to live with continuing and possibly accelerating sea level rise. The solutions lie in land use policy and engineering/technology. These two cases promise to be very interesting, not to mention profoundly important in determining how the political debate surrounding climate and energy policy plays out in the U.S. I find the two cases to be interesting when considered together, regarding who is getting blamed. The California case blames the petroleum companies. They somehow knew better, and apparently should have stopped producing fossil fuels. The Juliana case blames the federal government: the U.S. government that declined to sign on to the Kyoto protocol, pass a carbon tax and trade bill, and a Senate that declined to vote favorably on the Paris agreement. Never mind the consumers and businesses dependent on fossil fuels. The U.S. public that squeals with outrage over the prospect of a few pennies added to the gasoline tax. And not to mention the rest of the world with rapidly growing populations with rapidly growing appetites for energy and grid electricity. I really ‘get’ the grandchildren argument — I have a 7 year old grandaughter that I would do just about anything for. While we’re at it, surely its not fair that our grandchildren should suffer through volcanic eruptions, hurricanes etc. Personally, I would not put a stable coastline at the top of the list, and I wouldn’t even put it on the list if it comes at the expense of any of the above. The bottom line is that there are no easy solutions and no obvious scapegoat to blame. These cases hinge on future damages, not on damages that have already occurred. This will be an interesting legal test of the precautionary principle: suing someone for damages that a model says will occur far in the future. It looks like Juliana goes to trial in early 2018; not sure about the schedule for California. It will be very interesting to see how these two cases play out. This entry was posted in Ethics, Politics. Bookmark the permalink. As many noted when the California counties story was posted elsewhere, wouldn’t it be great if all the defendants simply stopped supplying their death juices and vapors to the plaintiff counties. If the court finds against the US then presumably all fossil fuel use would have to stop on that day. That will have some interesting outcomes for everybody, especially the children. As for California, they could just ban the use of fossil fuels right now. Problem solved,. Only Congress has the constitutional authority to tax We the People, and to spend those taxes. See the Spending Clause (ARTICLE I, SECTION 8, CLAUSE 1 ) Treaties only enter into force with 2/3rds of the Senate’s approval. The Senate rejected Kyoto. President Trump has not submitted the Paris agreement to the Senate. QED. There’s a newly discovered fundamental right, rendered out of thin air by a federal district court in Oregon (yes, the Ninth Circuit, again! ), and it threatens to undermine the entire architecture of the U.S. Constitution. . . .In short, strict scrutiny means the burden of proof shifts from the plaintiffs to the defendants. The Executive branch has to prove it did not infringe on this new constitutional right — the equivalent of a bank manager having to prove she did not encourage the armed robber to wave a gun at bank patrons. . . . The stakes couldn’t be higher — a federal court creating a new fundamental right, and legal claims that call on the Executive branch to violate the Constitution. . . .But the new litigation strategy is to bring sweeping claims against the government (in the kids’ lawsuit case, eight federal agencies and the president himself are named as defendants), filed in the most liberal jurisdictions that can be found, with the hope that an activist judge will “discover” new rights and acknowledge outrageous and novel claims. order from this court. See Ninth Circuit Gen. Ord. 6.8(a). Petitioners’ motion to file an over length petition for writ of mandamus (Docket Entry No. 2) is granted. This petition for a writ of mandamus raises issues that warrant an answer. See Fed. R. App. P. 21(b). Accordingly, within 30 days after the date of this order, the real parties in interest shall file an answer. . . .
Additionally, the parties shall address whether the real parties in interest’s constitutional challenge to Section 201 of the Energy Policy Act is within the district court’s jurisdiction. I think Kyoto turned out to be a failure because the ozone hole didn’t shrink. I saw a story recently that pointed out that for every ton of ozone destroying chlorofluorocarbons gas we stopped producing chemist developed substitutes that were just as bad but were not covered by the original treaty. It’s like the drug patent game. Every time Merck, Bayer etc. start to loose patent protection their chemist just tack on a few new molecules and presto!, another patent and the money just keep flowing. Mixing up the Kyoto agreement with the Montreal Protocols does not make you appear informed. I think you find the core of my comment is has some merit. The D.C. Circuit Court of Appeals vacated a 2015 EPA rule targeting the use of hydrofluorocarbons (HFCs), a class of potent greenhouse gases that are used as refrigerants and propellants for a variety of purposes as a substitute for ozone-depleting chlorofluorocarbons (CFCs) and hydrochlorofluorocarbons (HCFCs). CO2 accounts for the majority of human-caused greenhouse gas (GHG) emissions. But other GHGs are still significant drivers of climate change, and an increasing proportion of GHG emissions now comes from “high global warming potential” fluorinated gases (high-GWPs) such as HFCs, CFCs, HCFCs, perfluorocarbons (PFCs), and sulfur hexafluoride (SF6). These gases, on a per-molecule basis, trap heat thousands of times more than CO2. The trick is that chlorine-containing gases in this group–CFCs and HCFCs–can react with ozone in the stratosphere and significantly damage the ozone layer. No jack, your core comment still lacks merit. 20+ years later and the ozone hole is still with us. It still is not where “science” predicted it would be. We still don’t know how the ozone hole came about or how long it has been there. Would this not make the county complicit in the “crime”. Are they not using fossil fuels, buying and running fossil fuel powered vehicles, consuming plastics and other byproducts of fossil fuels in their public infrastructure and services? Do they not get a considerable portion of their electricity and the majority of electricity security from fossil fuels? Pot and kettle it seems to me. The proper suit would be against all world governments that have subsidized solar and wind power, turned corn into fuel, opposed fracking, taxed carbon, and otherwise made life more difficult for the poor. collecting, see Matt Ridley ‘The Rational Optimist’ on that. It’s not the small amount of land that wind and solar use that are a problem. Land can be reclaimed or have dual uses but it’s much harder to restore the loss of water under the ground. Scientists warn that more than half a century of groundwater pumping from the High Plains Aquifer, also known as the Ogallala Aquifer, has led to long segments of rivers drying up. At the lowest point of the ocean during the last ice age it was about 400′ below it’s present level. The last Ice Age lasted about 120,000 years. If we say it took 60,000 years to make the ice, and the same to melt it then it averages 6.67′ thousand years. I forgot to mention we started this Ice Age about 12,000 years ago. Since then the earth has produced about 600′ of new ice at the Antarctic and I a similar amount at the Arctic. Look at the CO2 level of the new ice. Care to name a few of those climate refugees? It is truly amazing how some people can get so worked up and worried about things that have yet to be proved. If these cases really do go to trial, the plaintiffs better have their causation argument figured out. It will also help if the defendants do not play dead. Oh, and if they are worried about future damages an injunction would be the only proper remedy. As somebody said above, prevent the evil boogie monster from supplying any and all fuel, energy or fossil sourced products to the populace of the USA. See how well that goes down. The best undisputed evidence that the defense has at their disposal might be Exhibit A – The 2.5 billion dollar bill that the UN members just paid for refurbishing the UN Headquarters building which sits on the bank of NYC East River. How much credence does this lend to the UNFCCC/IPCC predictions which will surely be cited by the plaintiffs? It’s a very hard argument for the judiciary to make. To have standing one has to how harm to people who may or may not exist in the places that may or may not be affected in the way described. Then you have how to calculate theoretical damages and theoretical people and where to attribute them to. Then you have separation of powers, how can the judicial rule on what is best for the United States, that is for the Congress and Senate and implementation by the Executive. There is so many ways to attack the arguments, it soon doesn’t have any legs to stand on. It’s part of a campaign of attack of uncertainty. It feels like the courts are assuming both the executive and the legislative powers. Your post opens with a massive assumption and logic jump. The first sentence is about attribution of climate change, not impacts. The second section is about damages. The premise that global warming would be damaging does not appear to be supported by valid evidence. @Peter Lang, you know and I know that all the wind turbines and solar collectors and electric vehicles are not going to stop sea level rise, if the current natural warming continues. Remember that the warmists are very well-funded and will have no problem finding witnesses to prove that a rise will wipe out some very expensive real estate in Miami, Venice, London, New Orleans and New York, as well as some not quite so expensive real estate in Bangladesh and the odd atoll where the coral grew too slowly to keep up. If so sober and responsible a scientist as Judith Lean attributes a good chunk of the warming to human activities, the attribution battle will be lost to sheer weight of testimony. Hansen’s prediction of a 5m rise this century seems to be sheer exaggeration, or a decimal point went astray somewhere. That’s the angle I would attack. I should have mentioned, the damage costs are for the world in 2100. US$1 trillion for a 1 m sea level rise in 2100 at 1% pure rate of time preference; $200 billion for 0.5 m rise. These are trivial compared with world GDP in 2100 (as shown in Figure 3 in the Tol (2011) working paper linked above. I don’t see these cases going anywhere. You have to be able to draw a straight line between a cause and an effect. Not easy, especially when the effect is still in the future, and the causes are multiple and aggregated. Jim D, many would have thought they would not have made it this far along. What in particular do you find problematic, if you don’t mind being on the opposite side of James Hansen? Legally it is problematic. Morally it is on point. Jim D, when something doesn’t pass legal muster it is rarely morally on point. Laws must be carefully crafted not to cause more harm than they solve. Controlling morality comes with the price of infringements on, life liberty and pursuit of happiness. 1) Defining the victims. As Cerescokid points out below, unborn are given standing for events hypothesized to occur. If we remove the unborn from the class we also remove the only innocents who have not used fossil fuel. 2) Defining the defendants. Who made the decisions that caused the hypothesized harm? In the case of illegal drugs the US law criminalizes both the producer and consumer. The defendants could in fact only be the unborn since all living people in the US, even the Alaskan Bush People, have used fossil fuel. However, lawyers did try to form a class for cigarette smokers to try to sue tobacco companies on their behalf. 3) Defining the damages. Surely this alone would take a 100 years. 4) How to compensate. Who gets paid what, when? How holds the reward on behalf of the unborn? Law is based on the reasonable man. If society is acting reasonably to determine fossil fuel’s impacts, and reasonably to limit its use in the weighing of those impacts against gains, there is no violation. Jim….Jim, is that you? It’s not some imposter who has hijacked your name, right? There is too much common sense in what you’ve said. I actually agree with you. I’m a little surprised you’ve raised the straight line between cause and effect, since it seems to run counter to most your comments. But it would be interesting to have the opposing counsels bring in expert witnesses to develop and attack those straight lines. What theater. Perfect for live TV. For some it would put the OJ trial to shame. Where is Johnnie Cochran when you need him. I do wonder, though about the question of the unborn having standing as a plaintiff in this lawsuit. But that is a whole other kettle of fish. There are legal arguments and scientific arguments. I prefer to stay out of this legal one. I have also said before I think Steyn could win his case against Mann, not because he is right, but because he has the satire defense, being a non-expert whom reasonable people would not take seriously on his accusation. You only have to listen to him to see that he is a showman, not a scientist. Progressives should fear this lawsuit. By it’s logic, the national deficit is a greater threat to James Hansen’s grandchildren than climate change. Jim D: I don’t see these cases going anywhere. You have to be able to draw a straight line between a cause and an effect. Not easy, especially when the effect is still in the future, and the causes are multiple and aggregated. What do you mean by “anywhere” — do you envision the possibility of acquittals? The line between CO2 increase as cause and harm as effect is indeed hard to establish: that is the “skeptical” view. The line in this case is between a specific perpetrator and specific victims. Many dump CO2 into the air and many suffer from that aggregate effect. I am not denying that. Who do you blame for which part of the effect? If you are apportioning damages and reparations, that is one way a carbon tax can be used. It generates revenues to pay for mitigation and adaptation or disaster relief costs. If you had a class action for all the future victims, we should all pay them according to our proportion of the CO2 emissions. That would be the fairest way. It’s mostly political grandstanding. No legal mind worth their weight would go for it. This is a big mistake by the climatists because in court they will have to produce evidence. Oops! And they demand hard evidence. I know. Not being privy to the “factual” basis of the two law cases, but agreeing with the cogent points above, remember one thing: The first thing they teach in law school is that one can’t predict what a judge will decide. Both cases will end up in the US 9th Circuit Court of Appeals (known to be very liberal)and then go to the US Supreme Court. I look forward to witnesses for the plaintiffs being cross-examined under oath. I hadn’t thought about the “under oath” angle. Hmmm, I’m sure we can all go all sorts of delicious directions with that one. Agree. The plaintiffs have not thought this out, and there are several lines of questioning that will expose a lot of the junk climate science. Attribution, failed CMIP5 models, observational sensitivity, temperature ‘adjustments’, greening. To elaborate, I think of it as an alternate red-team vs blue team exercise. The blue team being the witnesses for the plaintiffs, the red team being the technical experts hired by the defendants. Instead of testifying, however, the red team members will guide the cross-examination of the blue team witnesses: introducing contradictory scientific publications (e.g model vs data comparisons) and requiring that they respond; introducing contradictions in the witnesses’ prior statements; being alert to contradictions within the witnesses’ current testimonies, and between witnesses. Complete and utter waste of taxpayer money, with judges engage in a trivial pursuit, while actually important matters are neglected. The judges need to be removed from the bench for incompetence, stupidity and willful disregard of established US law. In other words, these clowns are attempting to legislate from the bench. Back in the 1990s, I looked at the IPCC’s various economic projections for 2100. They showed that without action to reduce emissions, world GDP in 2100 would be seven times that in 1991. Seven times! Even with a doubling of population (and that is expected to cease growth mid-century), average incomes in 2100 would be 3.5 times those today, with biggest gains in those countries less developed in 1991. How dare we inflict a seven-times income rise on our descendants! Absolutely shocking! James Hansen said the oceans would boil off and we’d get an atmoshpere like Venus if we don’t stop our evil ways. (By “evil” Hansen meant burning fossil fuels to make the planet a better place for humanity and the environment). Does this mean Mr. Hanson and his Granddaughter will be awarded money if they win the case? … or ordered to pay legal costs if they lose? One shouldn’t gamble what one can’t afford to lose. So the saying goes. Presumably then, Mr. Hanson is independently wealthy, or perhaps someone is bankrolling him. And I fail to understand how anyone can sue for anything that hasn’t happened yet. Do we now sue our respective governments for allowing us to cross the road because there’s a risk we could be run over? Who knows about funding? Time will tell. Sueing for things which haven’t happened is pretty easy in the form of injunctions. Common examples are injunctions prohibiting people knocking down old buildings. I don’t mean to worry anybody but the common law is quite adaptable. A well known example was for asbestosis. Because it takes only one fibre to trigger the disease proof was impossible until courts allocated liability proportionate to exposure. A good opportunity for a red-team / blue-team exercise ? The younger generation is the healthiest, richest, most long lived and most cosseted generation in the earths history. They have been direct beneficiaries of astounding advances in all manner of human endeavour over the last few centuries, due entirely to the route mankind took with regards to creating cheap, available energy that is the bedrock of our modern society. Surely the ‘other’ side of the story needs to be told in court and the young need to acknowledge the advances brought about by the very things they are denouncing. Its a shame nobody will create another ‘Its a wonderful life’ whereby they can be shown the miserable, unhealthy, unhappy, short, lives they would have lived if it had not been for fossil fuel. Politics,’ offers a historical perspective on same. Before fossil fuels my ancestors were wealthy. They lived in mansions full of only the finest things. They had servants. The industrial revolution started with wind and hydro, and we were living quite well: many into their 90s. If you visit one of the family cemeteries, many wives died in childbirth and a lot of children died very young. After that, they generally lived long and very prosperous lives. I will take your reply as satirical or as a member of one of the few landed gentry who had a great life on the backs of others. Can I claim some reparations from your family? And apart from the wves dying in childbirth and Many children dyng young they had a great time. My ancestors were not landed gentry. They were among the early settlers in the Shenandoah Valley, establishing a log fort to protect the community from attack around 1720. Uh oh JCH, you are descended from oppressors. Those attacks were from freedom fighters. This should be settled in court. The Shenandoah Valley was settled way before 1720. Your folks were not settlers. They were invaders. Yet you seem to speak of them with pride. Don’t let it get around in your antifa crowd. Your comrades will call you a white supremacist and come after you with bricks, flagpoles and pepper spray. If there is one thing that history has taught us, is that we don’t learn a damn thing from history. This newest case/attempt is using the ploy of children for sympathy. This latest attempt is attacking the government as a catch-all basin. Yet, the “consensus” supporters have always prior claimed that it is the so-called deniers of this consensus that is causing GW conditions to worsen. The courts should insist that these plaintiffs charge the direct cause not a catch-all. The “deniers” should be put to the test in court. This, however, would surely backfire, and must be prevented at all costs. But we did! We have the documentaries “The Big Short” & “The Wolf of Wall St.” to show the lower class that the ends justify the means. Judith I made two interesting observations which are too obvious to not consider them seriously. The pack ice does not melt! If you look at the annual ice extent graphs on the National Snow& Ice Data center page, here, the new ice is expanding year after year during the summer minimum of September. From this point of view, the new ice do not melt. On the other hand, if you look at the old ice in a single year, they lose their extension during the autumn months and the beginning of winter. It is unthinkable that these ice melts during a time of year when ice is on the contrary freezing and forming. I also noted by watching the animations of the variation of the ice, that these are pushed out of the Arctic Sea during the great autumn storms and the beginning of winter. Seem to have cooled below freezing in the Arctic early this year. http://ocean.dmi.dk/arctic/meant80n.uk.php Though of course it may warm up. A judicial media circus brought to you by the circus clowns on the 9th Circuit Court. Obviously it will be thrown out by SCOTUS if it gets that far. Someone ought to start impeachment proceedings for west coast judges who are derelict in their duty to stop cases like this from rising beyond early motions to dismiss. If the jury finds for the plaintiffs on the damages then SCOTUS will probably throw out the case on the legal arguments, but not on the jury findings of “fact.” This is a serious case. See my comment below. I don’t think it’s obvious this will be thrown out. These cases don’t progress unless there is an element greasing the skids. Our case is based on the rock-solid foundation of our Constitution. Before it becomes a constitutional issue, they need to create a rock-solid foundation of the science. Right now, that foundation is more sand than rock. Very, very fine grain sand at that. Juliana is a dangerous case. It is likely to go to trial because it alleges present as well as future damages. The climate science literature is awash with articles claiming probabilistic human contribution to present weather extremes, so the plaintiffs should have no trouble finding experts to testify. Even worse, the US has officially declared that CO2 emissions endanger health and welfare. So the plaintiffs could win on the damage claims. They are asking the Court to require the Executive Branch to act. This is common but usually based on statute. In this case the legal arguments are Constitutional, hence pretty radical, which the present Supreme Court is likely to reject. But the win on the damages opens the door to other legal arguments. The use of children is a political stunt. There is nothing in the complaint that is unique to children. I agree. There is no immunity from a court making an incompetent or misguided ruling and then letting the chips fall. David Wojick: The climate science literature is awash with articles claiming probabilistic human contribution to present weather extremes, so the plaintiffs should have no trouble finding experts to testify. Cross-examination will be key: properly informed cross-examination will require the plaintiffs’ witnesses to respond to uncertainties, imprecisions, contradictions in the published papers that they cite, and papers that they do not cite. Do we blame our grand-parents for not having done what they didn’t do, even if they should have? Shall we now plan in their name a life made of restrictions, coercions, and eternal apocalyptic worries, for the promise of a quite improbable shining future? Don’t we have to sweep in front of our current door ? BTW: it’s quite innovative to lawyer-up the future! Blaming ancestors is quite fashionable these days. The answer is the consumers. Including corporations and individuals also including the co-defdndents. Anyone who used or is using energy. It’s obvious but I’ll say it anyway. The producers cannot be blamed because the CO2 is not emitted by them. The consumer is the one that produces the CO2 by burning the fuel. If there is no demand there is no supply. Now if they were to outlaw fossil fuels then it would be like the drug trade and they could arrest and prosecute the dealers. Given that there will be expert witnesses on both sides who will point to thousands of “peer-reviewed” papers supporting their claims, how will a jury sort this out? Not a sure thing at all. With a liberal judge who controls the procedure, decides what evidence may be introduced and instructs the jury I am not optimistic that truth and justice will prevail especially as the US Government has shot itself in both feet several times over with the endangerment finding, climate assessments, many speeches and testimonies to congress supporting the plaintiffs’ side. These cases increase the urgency of getting a red team counter-assessment out soon. These cases are nonsense, but dangerous nonsense. There is nothing to restrain a federal judge from going off the rails but other federal judges, and no reason to expect reason from any of them. Putting science on trial and having a judge decide the issues is sheer lunacy, but that is what our legal system allows. The Juliana case has already revealed that the judge (Judge Aiken) is ready to make history, and she considers herself capable of determining the science and the law, including whether the plaintiffs are entitled to declaratory and injunctive relief. Judge Aiken finds authority for her ambitions in recent writings from a judge and author of earlier Oregon precedents, Oregon federal district court Judge Goodwin, who 50 years ago had found that access to Oregon beaches “belongs to the people”. Judge Aiken’s quote in the current case: “Federal courts too often have been cautious and overly deferential in the arena of environmental law, and the world has suffered for it. As Judge Goodwin recently wrote, The current state of affairs … reveals a wholesale failure of the legal system to protect humanity from the collapse of finite natural resources by the uncontrolled pursuit of short-term profits …. [T]he modern judiciary has enfeebled itself to the point that law enforcement can rarely be accomplished by taking environmental predators to court. … The third branch can, and should, take another long and careful look at the barriers to litigation created by modern doctrines of subject-matterjurisdiction and deference to the legislative and administrative branches of government. Alfred T. Goodwin, A Wake-Up Call/or Judges, 2015 Wis. L. Rev. 785, 785-86, 788 (2015). With a judge like Judge Aiken presiding, there are no limits to the nonsense that may be forthcoming soon from that court. If she finds against the USA will all use of fossil fuels across this country simply, and immediately, cease? U.S. courts are increasingly wading into areas totally outside their jurisdiction. Science – even bad science – is not a matter for courts to decide. Courts have redefined a marriage and gender. Now they aim for more. What is the difference between God and a federal judge? God knows that He is not a federal judge. Note: Judge Goodwin was an Oregon Supreme Court judge, not a federal judge. Location, Location, Location — the first rule of filing federal law suits. The plaintiffs have chosen California and Oregon — one by default (the California counties) and one by political leanings of federal judges in the district courts. The California and Oregon federal courts are famous for political and social justice rulings — often ignoring the rule of law entirely. Someone is spending a lot of money on these cases – it would be interesting to know who is actually paying the bills. Let’s blame cigarette smokers. Yeah, that’s the ticket! So does this mean the youth will be suing AIPAC next for sending America to war all throughout the middle east and racking up trillions of debt? The law in America is a mockery. These cases raise numerous complex legal issues. There is arguably no present harm, so no damages. The only future harms are based on models, and those are easy to attack on several grounds as Christy did in his March 29 testimony to Congress, or my recent WUWT post on why models run hot. Injunctive prospective relief is dubious, because the US is not the only emitter and has in fact been reducing emissions thanks to fracked natural gas.. What the cases may do, however, is enable a legal red team attack on plaintiff’s warmunist theory under oath, so pain of perjury. Exposing the IPCC for the junk science it largely is, using just a few big points like attribution, sensitivity, lack of SLR acceleration and no real connection to increased extremes. If carefully thought thru, provides a fact base for appelate review of the entwined legal issues. Do courts bear any responsibility? Presumably you mean for outcomes? The general answer is NO. Cases of judicial malfeasance are rare (somebody bribes a judge). Either an appointed master, a jury, or the bench (if the parties agree) decides facts in dispute, then the court applies relevant law to getnthe adjudicated outcome. The court is not responsible for presenting or rebutting facts. That is up to the parties and their legal representation. There are many kinds of corruption of mind, not only those that are caused by bribery. Obviously, it is not unreasonable to suspect judicial malfeasance by the judge – if the context refered to in this comment is true. Based on the logic underlying these lawsuits, butter and eggs would have been outlawed many years ago and since then we’ve all learned that “eggs got a bad rap” and saturated fats are necessary in a healthy diet. The government ‘Food Chart’ which has been revised many times with complete reversals of prior views, is emblematic of the reasons why the legal weight of supposed ‘expert opinions’ has undergone a sea change in the federal courts, as codified in the Daubert standard regarding the admissibility of expert witnesses’ testimony. Anyone want to join me in a lawsuit against the government for its failure to invest in perpetual motion research and development? Whether a dispute regarding climate science might be adjudicated by the courts came up in the UK in 2015. And it did so at a very senior level when Professor Phillippe Sands QC, professor of law at King’s College London and a leading international lawyer, was invited to deliver a lecture in the UK Supreme Court. The text of his lecture can be accessed here: https://www.kcl.ac.uk/law/newsevents/climate-courts/assets/CLIMATE-CHANGE-INT-COURTS-17-Sept.pdf And my notes on the lecture here: https://ipccreport.files.wordpress.com/2015/10/notes-on-sands-lecture_ty.pdf. … for the courts to purport to settle a legitimate scientific disagreement, would strike at the essence of the Scientific Method – the basis of scientific practice for over 150 years. It would risk bringing international law into disrepute. I suggest a similar sentiment might apply to any US court taking upon itself the resolution of a scientific matter. This is going to be almost as good as “Buck v. Bell” (Supreme Court 1927). We should build a A.I. system to decide the issue. We humans trust our machines more than we do each other. In any case, there seems to be a fundamental weakness underlying these actions. The US emits only about 14% of global GHG emissions – so, even if an action might prevail in theory on the science, how could the US be held responsible to the plaintiffs when other countries are emitting 86% of GHGs? How about a ‘Carbon Content’ tax on all the stuff the US imports from those other countries? We didn’t emit the GHG when those 3rd world countries manufactured the products our consumer driven economy consumes but it was a major factor when some of our most polluting industries decided to outsource production to China, Mexico, Philippines etc..
Jack: there was a time when the ‘embodied emissions’ claim was powerful. No longer. 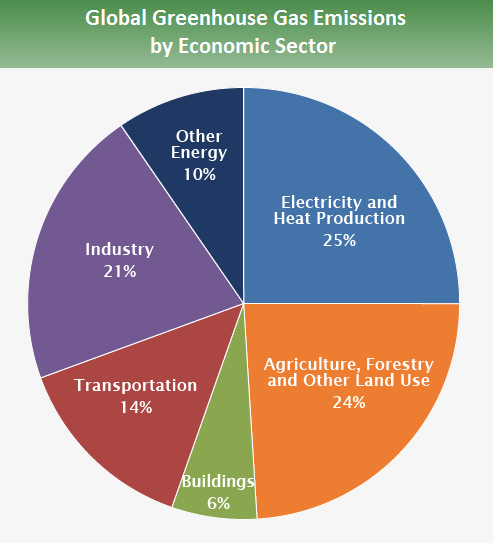 The 2014 consumption-based figures can be found here: http://www.globalcarbonproject.org/carbonbudget/16/files/GCP_CarbonBudget_2016.pdf Note how, even from that perspective, China is still responsible for by far the highest percentage of global emissions. In any case, these figures include goods etc. the developing countries export to each other. The reality is that the world has changed radically over recent years: today China is a massive consumer-led economy. Probably they’ll say the U.S. is at fault indirectly, for withdrawing from the Paris accord. They might try. But it wouldn’t affect the argument that the US emits (and will continue to emit) only a small proportion of global emissions – especially as the Paris Agreement lets the developing countries, responsible for over 65% of emissions, entirely off the emission reduction hook. 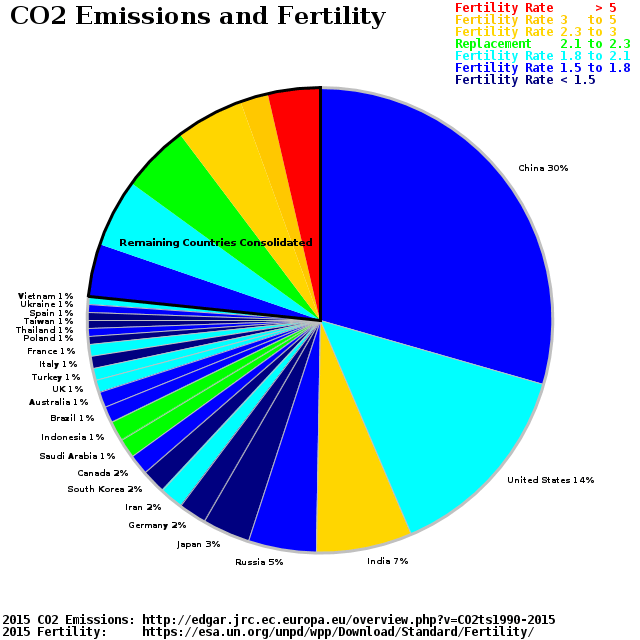 Most of the CO2 emissions from developing nations are from countries with population declines baked in the cake because of their less than replacement fertility rates. I know this about emission but you know what surprised me was that we import so much food from China and agriculture is a major source of all kinds of pollution with GHG being the part that disperses across the planet and is can only indirectly be traced to point of origin. China is the third leading supplier of food and agricultural imports to the United States. Primarily imported fish, shellfish, poultry, juices, canned fruits and vegetables. The vast majority is processed food so it is excluded from country-of-origin labeling requirements. Well let’s hope our USDA does a good job screening this food for excessive hormones, antibiotics, bacteria and heavy metals. I hope the planned 21 percent cut in the USDA budget doesn’t cut back inspections too much. More likely we find out if there is a problem when the CDC has to issue a warning. Bon Appétit! Chinese food imports to US. It’s about context jack. China is a minor source of food imports to the US and that amount is swamped by what the US exports to China. Their complaint asserts that, through the government’s affirmative actions that cause climate change, it has violated the youngest generation’s constitutional rights to life, liberty, and property, as well as failed to protect Their complaint asserts that, through the government’s affirmative actions that cause climate change, it has violated the youngest generation’s constitutional rights to life, liberty, and property, as well as failed to protect essential public trust resources. Counter lawsuit: Prove that warming, like that which occurred many times, over the past ten thousand years, was caused by CO2 and not by the same thing that caused past warmings. Prove that whatever caused past warmings has stopped. Identify what caused past warming and identify what stopped. Prove this warming is not a continuing natural cycle. Occam would have said, whatever caused past cycles has not stopped and the future cycles will look like past cycles and we are well inside the bounds of past cycles. File a lawsuit or counter lawsuit in a different court that is not so extremely liberal. The reason for a different court is clear. They picked a court biased for their cause. That is cause for change, or, should be. Sue them to prove that whatever caused climate cycles of the past is not causing the current cycle. Sue them to prove what caused cycles of the past and prove it stopped. Sue them to prove we are outside the bounds of past cycles. Occam would say that whatever caused past cycles is most likely to cause future, similar, cycles. This is very clearly a case of “The King Has No Clothes On” They say if we did not burn fossil fuels, climate would achieve an equilibrium temperature and never deviate from that, That has never happened. Past temperature had repeating cycles of warm to cold to warm to cold. Now they say that if we quit burning fossil fuels, temperature will stop doing what it has always done and reach a temperature and hold it. I can’t write here what I think of that. With all the prospective warming, there will be no need for clothes. Been doing several hours of reading on the underlying legal issues independent of red/blue team climate facts. There are two separate sets: standing, and constitutional rights. Standing generally requires three things: 1. actual or imminent personal harm, 2. causality, and 3. redressability by the court. As a rule, there is no standing for a generlized grievance (being a taxpayer does not enable you to sue to invalidate some law entailing spending unless you are personally affected). 1. There is pretty clearly no present actual climate harm. Weather extremes would fail the causation test. There is also no imminent harm. Climate is weather expectation changes over 30 years by WMO definition. Stuff in 2050 (Hansen speculated SLR) or 2100 (2C) simply isnt imminent. 2. The only causation is in climate models, and those fail in two ways. A. Christy’s congressional testimony 29 March show the CMIP5 discrepancy between model and observation for tropical troposphere. Another example is the discrepancy between observational and model sensitivity. B. The warming ~1920-1945 is essentially indistinguishable from ~1975-2000. But AR4 WG1 SPM figSPM.4 said the former period was not attributable to GHG; not enough of an increase. It follows that the warming 1975-2000 cannot be attributed to GHG because natural variation did not stop in 1975. No firm causal link can be established. This lack of causality is further shown by the lack of warming this century despite it comprising ~35% of the increase in atmospheric CO2 since 1958. 3. Redressability. The US is reducing emissions. The court has no jurisdiction over China. So any speculative future harm is not redressable. Second is the legal theory about constitutional rights. The Oregon judge relied on two colorable constitutional rights theories in allowing the suit to proceed. 1. The public trust doctrine applies to things like navigable waterways (which must remain public–Commodore Vandererbilt’s famous 1834 lawsuit against New York concerning monopolizing the Hudson River and excluding his New Jersey based ferries was the basis of his fortune). It has never been applied to the atmosphere, let alone climate. And it has never been applied to the federal government. Colorable? Not. 2. The substantive due process doctrine is anchored in broad interpretations of 5th and 14th Amendments. Favored by progressives, anathema to Thomas and Gorsuch. Was implicit in Brown v. Board of Education, the context being entitled to ‘life, liberty, and property’ (14th Amendment section 1) with good education being ‘property’. Has never been applied to something speculative in the future. Deprived of life? Nope. Liberty? Nope. Property? The claim would have to be that the right to a stable climate is a personal property right. But this fails since the climate demonstrably isn’t stable. See standing point 2, causation. No wonder even the ridiculous 9th Circuit Court of Appeals granted a writ of Mandamus concerning the District Court judge’s decision against dismissal of Juliana v. U.S.
that greenhouse gases do not influence the radiative properties of the atmosphere. and no one currently posting or commenting here – understand the underlying dynamics of a spatio-temporal chaotic climate. I may not either – but being in the right ballpark there is at least a fruitful line of inquiry possible. The empirical manifestations of this have been evident for decades – from Harold Hurst to Wally Broecker and Anastasios Tsonis. There are moreover physical links in important components of the system such as UV/ozone chemistry – surface pressure at the poles – ocean gyres – ENSO – clouds that are promising mechanistic explanations for natural climate variability. This provides no comfort – however -for skeptics. Anthropogenic greenhouse gases will perturb the flow in Tomas’ mountain river. How many quasi standing waves will this influence? It depends. But I digress onto my favourite topic. I’d turn the court cases back on to the extreme limits of natural variability for which the solution is building prosperous and resilient communities – and contend that fossil fuels are critical – at this time – to fulfill this duty of government. Equally – that the provision of cheap energy to industrializing economies is a humanitarian necessity. “More than one billion people globally lack access to electricity, and billions more still burn wood and dung for their basic energy needs. Our High-Energy Planet, a new report from an international group of energy and environment scholars, outlines a radically new framework for meeting the energy needs of the global poor. Be a little bit imaginative and enter some new facts. I’d also take a broader perspective on greenhouse gases and point the limited utility of too narrow a focus on certain sectors. As opposed to the many successes of multi-sectoral approaches. The progress on carbon intensity over decades, the net negative impact in the agriculture, forestry and land use sector in the US and the growth of gas generation for instance. Progress will accelerate. The US is making major investments in future energy technology, it is moving rapidly to new ‘negative emissions’ methods in agriculture. Moreover the US is a global leader in climate monitoring in both space and the ocean depths. We call it – in a criketing metaphor – going onto the front foot. No disrespect to the host (because I’m talking averages here), but this nonsense is a consequence of the feminisation of society (which includes mourning the advent of the industrial revolution – and indeed, all human progress). For some that is the ideal (along with the romance of dysentery, death in childbirth, etc, etc). The people causing CO2 emissions from fossil fuels are not the government or the fossil fuel companies, but the end users, which is all of us, including the little darlings bringing this law suit. We the public are the ones who burn the fuel or pay someone to burn it on our behalf. Do the plaintiffs not have home heating, air conditioning, tablets, phones, motorised transport, game consoles, toys, nice clothes, and all that goes with American middle class life? Each one of them is probably responsible for the burning of more fossil fuel than a whole African village. Yes, that is the thinking behind a carbon tax. Hansen is a big proponent of a carbon tax. Maybe his case is a way of leading the defense to blame everyone else for emissions, i.e. us, and that logically then leads to a carbon tax as a source of payment instead of the defense. Let them make that case. I thought Hansen was a showman and not a scientist? Illogical. Blame does not logically lead to imposing a carbon tax. Must first show validated model predicting temperature increase/decrease and similarly for CO2. Then show that the majority temperature increase is due to anthropogenic causes. Then that consequences, costs, and that the cure is cheaper than the pain. None of that has been done yet. Well, they have but you don’t want to believe it yet. Sorry – that should have been addressed to David. It has not been “shown” that CO2 emissions are responsible for much global warming, since no such direct measurements exist. All there is, is a plausible but as yet untestable conjecture to that effect, complete with its models, often misrepresented as reality. The forcing is dominated by GHGs and the imbalance is positive meaning that the warming trails the forcing, so there is more in the pipeline. More modelspeak being misrepresented as real measurements. What is the actual (measured) imbalance in absolute terms per unit of time ? What rate of warming should that cause ? Was it zero during the Pause ? Or is hidden heat still in the frame? How well does it marry up with CO2 changes ? The imbalance is about 0.5-1 W/m2, being mostly the OHC increase that is measured at that rate for the last decade or so at least. The fundamental message from the positive imbalance is that the forcing is leading the warming. That means the warming (because some is still due) is more than 100% from the forcing and the forcing is more than 100% from GHGs (with aerosols offsetting). Attribution arguments to the contrary are arguing with the data, not the models. If the imbalance itself had been directly measured in absolute terms, TOA instrumentation successfully calibrated etc, there would be no debate. But of course there is. What you seem to be doing is modelling it from the surface OHC. Models masquerading as measurements again. The rise of the OHC can come about no other way except for an energy imbalance that extends to the surface. If you want to disconnect the surface imbalance from one at the top of the atmosphere, you are even going against what skeptics like Lewis and Curry use for imbalance estimates, and you need to find someone who know about this stuff to support that cause, which is a new one to me. The best imbalance estimate is from the ocean heat content, and remember we only need to know its sign to make the 100% attribution argument. The imbalance is positive because the ocean, which represents by far most of the heat content, has a rate of increase on decadal time scales. This is measured and few, if any, deny that part any more than they would deny the existence of global surface warming on decadal scales, but there’s always some that would deny them. So, yes, the imbalance and surface temperature have observed positive decadal trends, and when you think about what that means, they show the 100% attribution as I mentioned. So the imbalance itself is NOT measured directly (from satellite data). Because we don’t have the technology. And you are indeed just calculating it from surface OHC. Which data is far from robust, nothing like the atmospheric data. You quite sure you aren’t oversimpifying here ? The ocean heat content’s rate of change is certain enough to know about its sign, which is all you need for attribution. They say 0.5-1 W/m2. The Argo measurements have made this trend more definite in the past decade where it is substantial. Jim D – So from sparse surface and shallow ocean data, you ‘calculate’ the ocean warming is all man-made (there being no such thing as natural warming; or heat anywhere except the surface, there being no such thing as currents), and even ‘calculate’ the magnitude of manmade warming. Makes one wonder why there is even a debate, or tax billions spent on models. The Gulf was 2 F above average. Mean global warming can account for a lot of that. Your speculative skills have never been in doubt. What’s the problem with producing CO2 emissions. That is the question that is continually dodged, or answered by innuendo and presumptions, but not with valid evidence. Note, in case anyone is confused, temperature change is neither good not bad. Only the impacts of the change might be good or bad.The assessment of total benefit or damage must be for the world economy in either percent GDP change, or net economic benefits minus costs, caused by global temperature change. The skeptics have yet to express why they think a 700 ppm climate is better or at least not worse than a 400 ppm climate. That is where they should make their case, but no one shows up when I ask that. You could ask if 700 ppm would be a better economy? People care more about their money than the climate on a Pacific atoll. The evidence is unequivocal, CO2 emissions cause greater wealth. A problem with the GDP loss estimates is that they count Africans much lower because their GDP per capita is only about 3% that of a US person. It needs to be quantified in terms of numbers of people and their livelihoods. You could lose the whole of Africa and that would only be, for example, 5% of the global GDP, so you can see how misleading that is as a bottom line. You need to look at true impacts, not just money. With increasing bipartisan support for the Electrify Africa Act, alongside Obama’s Power Africa initiative to double energy access in sub-Saharan Africa, calls for more equitable definitions of energy access are gaining traction. This includes support for energy technologies beyond solar lamps and cleaner cook stoves. HELE coal and gas generation is recommended until something cheaper comes along. No one shows up because they don’t want to waste time arguing against a speculative scenario – your 700 ppm – which is very unlikely to ever come about. Why don’t you argue for an AAMD system? Or a SVD&P system. Both have a higher probability of occurring than your made up 700ppm story. > The skeptics have yet to express why they think a 700 ppm climate is better or at least not worse than a 400 ppm climate. This will only become necessary if and when a credible science arises suggesting 700 is a problem, and that we’ll soon be there. We have a process for planning for the future and selecting priorities among possible actions, called representative government. Plaintiffs have an available remedy, but ask the court to relieve them of the responsibility of using it successfully. Policymaking is not meant to be accomplished by judicial fiat. Regardless of the merits of the complaint, the proposed remedy is troublingly anti-democratic. like the Clean Air Act, which is done all the time, quite another to go Constitutional. A case solidly based on the constitution. And also solidly based on uncertain, fake, partisan science. Brought by one of the chief fakers. A jury may not see it that way. Hardline warmers and skeptics will both probably be excluded. The experts will disagree with one another as usual. The foolish endangerment finding is a smoking gun. Arguing that the government is not doing enough is not a hard sell. Note that Hansen’s 1988 testimony is specifically listed in the complaint as evidence that the government has long known about the dangers. While the issue of blame may be academically interesting, that is not the point of the children’s lawsuit. They are asking the Court to order the Executive Branch to do more to force a reduction in emissions. This is a policy lawsuit and generically these are very common in environmental law. Pingback: Weekly Climate and Energy News Roundup #281 | Watts Up With That? Have any of the plaintiffs ever used fossil fuels? Do their families own cars? Cook with natural gas? Use electricity not produced 100% with non-fossil energy sources? And remember, the U.S. government IS the people — they’re basically suing themselves. What if they win? Where’s the money going to come from? Each U.S. citizen already owes approximately $67,000 of the national debt. Borrowing more money to pay any judgement will just make the debt burden worse, and the debt is also an intergenerational issue of the type the lawsuit purports to address. In any case Steven, as I’ve pointed out elsewhere on this thread, the US emits only about 14% of global GHGs: how could anyone in the US be held responsible to the plaintiffs when people and organisations in other countries are emitting 86%? They might have a better case against the Chinese Politburo. So perhaps they might have a better case against the UN which recently presided over an agreement (Paris 2015) that exempts developing countries (already responsible for over 65% of emissions) from any obligation, legal or moral, to cut those emissions – now or in the future. Er … sorry about the duplication. My focus is squarely on evidence to support the alarmists’ contention that global warming would be damaging. As far as I know such evidence does not exist. It seem the weight of evidence suggests global warming would be beneficial, not harmful. I’ve been asking for 20 years for the alarmists to say why they believe global warming is a threat and likely to be harmful. They either fly into a rage that they have been asked such a question (Mosher), or dodge and avoid answering, or try to bury the question in strawman arguments (such as “do you still beat your wife”), or innuendo and “lets assume the worst case”. Fair enough. In contrast, my focus – since 2008 – has been on this: even if global warming is a problem (I’m agnostic about that), it’s obvious that most of the world doesn’t care, preferring to prioritise economic development (& consequential poverty eradication). Therefore, why do we in the West go on and on arguing about the science (& associated ‘solutions’) rather than determining how best to deal with that reality? In contrast, my focus – since 2008 – has been on this: even if global warming is a problem (I’m agnostic about that), it’s obvious that most of the world doesn’t care, preferring to prioritise economic development (& consequential poverty eradication). However, I suggest it is just as important, perhaps even more important, to expand people in the high income countries to understand that the weight of valid evidence does not support the belief that global warming is a problem. It seems the weight of valid evidence shows global warming would be net beneficial for the world. Substantial so outside the tropics and negligible change in the tropics. However, I suggest it is just as important, perhaps even more important, to explain to people in the high income countries that the weight of valid evidence does not support the belief that global warming is a problem. It seems the weight of valid evidence shows global warming would be net beneficial for the world. Substantial benefits so outside the tropics and negligible change in the tropics. it’s obvious that most of the world doesn’t care, preferring to prioritise economic development (& consequential poverty eradication). Yes. And show they should. It shows the masses are much smarter than the academics, alarmists, environmentalists, bureaucrats and politicians. Therefore, why do we in the West go on and on arguing about the science (& associated ‘solutions’) rather than determining how best to deal with that reality? I’d suggest, the answer to your question is that people in the high income countries have grown rich, fat and lazy – just like happened to all empires before the inevitable decline (Greek, Roman, British, Spanish, Dutch, USA). They live in concrete jungles, watch discovery channel and consequently think they know everything there is to know about the environment. My point, Peter, is not about “the masses”. It’s about the policies of the governments of the newly industrialised countries, bizarrely classified as “developing”. For the past 25 years, these countries have insisted on retaining the exemptions applicable to them under the 1992 UN Framework Convention on Climate Change and, in pre-Paris negotiations, insisted, not just on continuing those exemptions, but on strengthening them. In so doing, they totally outmanoeuvred Western negotiators who for years had been trying to soften the developed/developing bifurcation. These governments are clearly unconcerned about dangerous AGW; otherwise they would not, for example, be continuing to build substantial numbers of fossil fuel fired power stations. Coming to terms with that reality should be a priority for the West. But it’s not. Or rather it wasn’t until Trump came to power – yet his sensible proposal that the Paris Agreement be renegotiated was rejected, almost with contempt, by other Western leaders. Why? Surely you’ve learned by now that debating this gets nowhere? No, I suggest that it’s time to regard the science as an important but secondary concern. I believe that the primary focus in the West should be on policy: how to establish an optimum course in a world where we are rapidly losing influence, where emissions will rise and where our trying to prevent that from happening is pointless – unless, that is, we can somehow persuade China, India, etc. to change course. But that seems exceptionally unlikely. I believe that the primary focus in the West should be on policy: how to establish an optimum course in a world where we are rapidly losing influence, where emissions will rise and where our trying to prevent that from happening is pointless – unless, that is, we can somehow persuade China, India, etc. to change course. But that seems exceptionally unlikely. I agree it’s about policy. However, I think your proposal and target is wrong. Dead wrong. It’s not China and India that need to change. It’s the high income counties (UIC) that need to change policy. They need to dump their focus on climate change and mitigation policies. They’re damaging their own economies and the world economy for no benefit. That’s what is not being understood in the HIC. I’d urge you too consider: “what is the appropriate climate policy if global warming is beneficial for the world?”. Once you have considered that, then start looking into the valid evidence. even if global warming is a problem (I’m agnostic about that), it’s obvious that most of the world doesn’t care, preferring to prioritise economic development (& consequential poverty eradication). Therefore, why do we in the West go on and on arguing about the science (& associated ‘solutions’) rather than determining how best to deal with that reality? Most of the world is right to prioritise economic development (& consequential poverty eradication). I agree we should be concerned about “determining how best to deal with that reality”. The reality is that the weight of valid evidence suggests any global warming that does occur will, be beneficial, not harmful. Therefore, the HIC should do as the rest of the world are doing – i.e. do nothing to reduce GHG emissions. Let free markets decide how best to meet the objectives of society. Once again Peter, you seem not to understand what I said. But, before I explain why, I think I should remind you that, with no scientific training, I’m agnostic about whether or not AGW (which I accept is probably real) is likely to be beneficial or catastrophic, or something in between. This Scott Adams article is a good reflection of my view: http://blog.dilbert.com/post/155121836641/the-illusion-of-knowledge. Therefore, I suggest you try to understand my position from that perspective. First, I’m not proposing that China, India, etc. should change course: that, as I indicated, is exceptionally unlikely to happen. No, my proposal is “that the primary focus in the West should be on policy: how to establish an optimum course in a world where we are rapidly losing influence, where emissions will rise and where our trying to prevent that from happening is pointless”. I regard that as a practical approach – it avoids yet more endless debates with (or attacks from) “alarmists” (as I’m not saying they’re wrong) nor should it conflict with the views of people like yourself (although I’m not saying you’re right). To expand on that, I believe the West should come to terms with international political reality (I don’t mean scientific reality – whatever that might be) by prioritising a strong economy, underpinned by reliable affordable energy, and by focusing on long-term adaptation to whatever climate change may occur. In contrast, your proposal is impractical because “high income countries” (by which I assume you mean the West – numerous “developing” countries are HICs that are not damaging their economies in the way you suggest) plainly don’t agree that AGW is beneficial. Maybe they should – but, until you’ve changed the minds of their administrations, academic and scientific authorities, leading commentators and opinion formers, MSM, NGOs, activists, etc., they’re not going to agree. And experience shows that trying to change those minds is a fruitless, time-wasting and frustrating activity. Surely you’ve learned by now that debating this gets nowhere? That applies to your argument, not mine. It seems there is no point in continuing, so ‘ll leave it at this. No. Look up the correct terms. Japan, Korea, Kong Kong, Australia, NZ are HIC and located in the East. Three UN treaties exempt the developing countries from any obligation, legal or moral, to reduce their emissions – and they’re acting accordingly. Two developed countries, Japan and Russia, seem not to be interested either. Altogether these countries are responsible for 75% of global GHG emissions. And, under its new administration, the US (responsible for another 14%) is also unlikely to do very much. That’s the international political reality. Western Europe, Canada, Australia and NZ are responsible for the balance – a mere 11%. It’s surely absurd for these countries to plough on with economy damaging measures – whether or not GHG emissions are dangerous? That should be obvious to most “alarmists”, although I accept it’s not easy to persuade them of this. But it’s far more likely to be successful than your plan of getting them to change their minds and come over to your point of view. You, and many other noble souls, have been trying to do so for years. And have made little – if any – progress. Repetition does nothing to make your case and boring. You simply have not come to groups with what is relevant for policy. What I explained its the Achilles Heel of the alarmists dogma, and what is undoing it. Make an attempt to understand it. You haven’t yet. Here’s a recent article by an Oxford University academic arguing that the “climate wars” can be won by shifting US public discourse from climate change to a focus on local pollution: http://tiny.cc/7renny. I think I answered him (and other commentators) reasonably well. Do you think you could have done a better job? If so, the thread’s still open – why not weigh in? I agree it’s about policy. However, I think you proposal and target is wrong. dead wrong. Its not China and India that need to change. It’s the high income counties (UIC) that need to change policy. They need to dump their focus on climate change and mitigation policies. They’re damaging their own economies and the world economy for no benefit. That’s what is not being understood in the HIC. I’d urge you too consider: “what is the appropriate climate policy if global warming is beneficial for the word?”. Once you have considered that, then start looking into the valid evidence.